Paul Ocepek had some time on his hands. He started sketching, then tinkering with a laser cutting machine, and soon he was creating 3D models of his playful characters and turning them into graphic clocks. Each of Paul’s creations is loaded with personality. 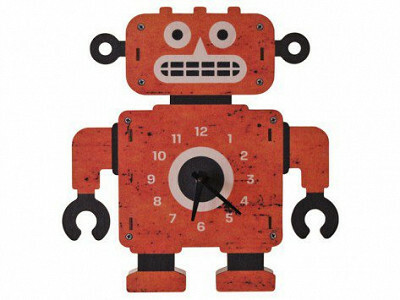 His pirate looks mischievous but not menacing, and the clock bot is charmingly robotic. The tweedy owl has a quirky, mod vibe, and the sockmonkey delivers just the right dose of cuteness. 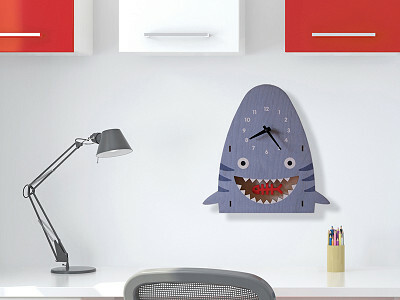 These funky time-keepers can stand on a tabletop or shelf, or hang on a wall in the kitchen, bedroom, or family room. Paul, who’s trained as an industrial designer, makes each Modern Moose clock to order in his Norfolk, MA studio. He uses birch plywood and nontoxic water-based inks (there are no glues or chemical coatings). He cuts the wood pieces with a laser, sands the pieces by hand, applies color using a special ink-jet printing process, and then assembles the parts by hand to create his layered compositions. Just in the nick of time. Designed by Paul Ocepek. Made to order. Happy almost Thanksgiving everyone! I'm thankful to be featured as today's Grommet. 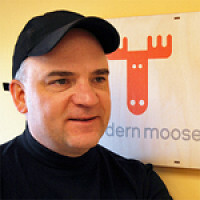 My name is Paul Ocepek and I am the chief sawdust maker at Modern Moose. After years as a consultant industrial designer developing products for everybody else, I thought it was about time I designed my own. My goal was to bring to life a line of products that would be unique, well-crafted, locally made and combine my passions for both product and graphic design. So here we are. I design and build every clock in my small workshop here in Massachusetts, or Moosachusetts as I like to call it. I hope to put a smile on your face and eyes on your walls. Thanks for joining me today. I think your clocks are adorable! I would love to see a truck clock. My grandson would love it. Just an idea. @Clare Bauer Thanks so much Clare, I appreciate that. Trucks will be rumbling down the road for sure! A garbage truck would make my grandson's day! His entire bedroom is about garbage trucks. @ RH I love the garbage truck idea! Thanks - I'll put that on my list. 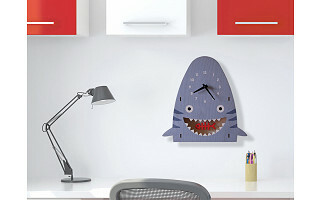 My daughter would love love love a dolphin clock!!! Since you're taking suggestions, how about a turtle clock? @ Charisse Turtles - shell of an idea;) Thanks Charisse. These clocks look fantastic! Does the cuckoo clock actually "cuckoo"? I have something of a moose obsession but..... prefer them in the wild rather than mounted. 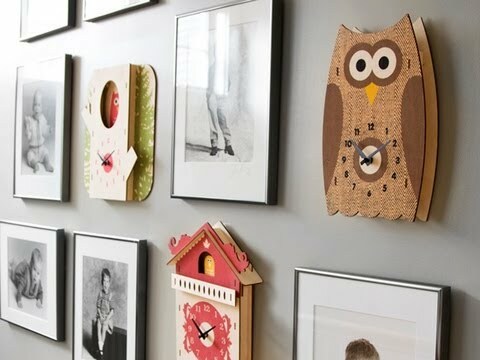 Would you ever do a moose clock more like the owl in the tree?? Like we might see it in the woods?? @Kathleen Hi Kathi - I can relate to whole moose thing;) Moose in a Bog...hmmm. Definite possibility. Thanks! @mike Who do you want to call? Hi Paul, I saw other designs in the video. Do you have others available or just the 9 we see here? @ DiscoDiva: We curate the strongest assortments & hope you'll enjoy the ones we offer. nay i please have the dimentions of the owl clock with the tree and the cookoo clock - thanks! and is the color red or more orange ?? @ christine Hi Christine - the Tree Owl is 11.5"W x 11.5”H x 1"D and the Cuckoo is 10.0"W x 11.5”H x 1"D. The color on both is definitely more red than orange. Thanks. Paul, your clocks are so great! My problem is I can't decide which one to get, I may have to buy an owl AND a moose for me and at least one more moose for a gift - for friend who lets us stay at his camp in the Maine woods every year. These are really neat and crafted in my home state to boot. Thank you Grommet for another great find! My wife and I have known Paul for many years through another business association and love him dearly. Great sense humor and style, plus he's a great dad!